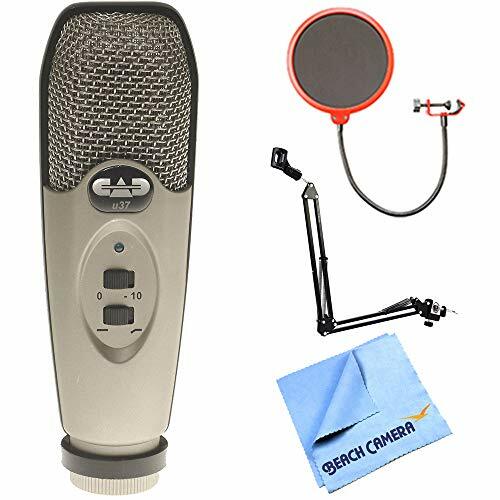 Record studio-quality audio directly to your computer via USB with the CAD U37 side-address condenser microphone-a great choice for both vocal and instruments as well as for creating podcasts and voiceovers for videos. Compatible with both Windows and Mac OS operating systems, you can simply plug the U37 into your PC and start recording. The U37 has two switches on the front. The first switch allows you to decrease the sensitivity of the microphone so the sound quality is clear for extremely loud sounds. For example, the switch should be in the "-10" position for loud voices, percussion and other high sound pressure level devices. The "0" position should be used for normal voices and string instruments. The second switch on the U37 is designed to reduce pickup of deep-bass sounds. The switch should be in the "Normal Bass" mode in most cases. However, if you want to remove wind noise, ventilation noise, or decrease the low frequencies in a recording, the switch should be in the "Bass Reduction" position. If you have any questions about this product by CAD Audio, contact us by completing and submitting the form below. If you are looking for a specif part number, please include it with your message.